The police is building up a case of extradition against Pakistan-based Wadhawa Singh and his two foreign-based sons-in-law Sohan Singh and Sewa Singh as their link in the jail-break has been established with the arrest of Gurvinder Singh alias Goldy. Goldy had named Norway-based Sewa Singh and Germany-based Sohan Singh as the persons who had provided him with the money to be given to Jagtar Singh Hawara. The police is planning to get the three declared as proclaimed offenders in the jailbreak case to pressurise Pakistan, Norway and Germany to hand them over to India, sources said. The police is likely to get the arrest warrants of the three foreign-based facilitators of Hawara in the case. However, the police denied that the arrest of Goldy had provided them any clue regarding the whereabouts of Hawara. Goldy told the police that he had met Sewa Singh three years back in Bangkok, where he asked Goldy to smuggle fake currency into India. Goldy told the police that he had delivered Rs 70,000 and a same amount again in August, September and October 2003 to Hawara who is believed to have used this for escaping, SSP of the district Shiv Kumar told Chandigarh Tribune. Meanwhile, the Fatehgarh Sahib police had taken Narain Singh Chaura and Baljit Kaur on production remand from the Burail jail to cross-check the information provided by Goldy. Goldy had also told the police that he was originally the person to pick up Hawara and others from outside the jail but ultimately the task was completed by Gurdeep Singh. He reportedly told the police that he had been told to avoid appearing in the court on January 16. He himself had planned to slip away to Germany taking help of Sohan Singh. He also disclosed that sons-in-law of Wadhawa Singh were allegedly involved in pumping fake currency into India. The Chandigarh Police today took a team of experts from the Central Forensic Science Laboratory to the feeder line near the Burail jail to collect evidence against Narain Singh Chaura, who had tampered with the electricity supply. A team of the Chandigarh Police today went to Patiala to find out the person in whose name the car PIQ 927 was registered. The three-member jailbreak inquiry committee headed by former Delhi Police Commissioner R.S. Gupta has failed to elicit any response from public to help it untangle the lapses that led to the jailbreak by Jagtar Singh Hawara and others. Mr Gupta, who came to the city from Delhi after a gap of 12 days, today said the committee had failed to find someone who could come forward and give information on the incident. The committee had published an advertisement in newspapers to elicit information from non-official sources and make the inquiry transparent. Mr Gupta said the committee would wait for two more days for information from non-official sources. The former Commission of Delhi Police said the role of those who were assigned the task by jail authorities would also be looked into. Mr Gupta’s statement today follows that of Union Minister of State for Home I.D. Swamy’s who had said that the guilty would not be spared and the inquiry must look into the role of the police. Terrorist Jagtar Singh Hawara and the three other fugitives walked barefoot from the exit of the tunnel to the boundary wall, a distance of more than 100 metres on the night of January 21. Experts from Central Forensic Science Laboratory (CFSL) have ruled out the possibility of the escapees crawling to the boundary wall from Burail Jail. “The foot marks upto the boundary wall are visible, proving that they walked the distance bare foot,” sources told Chandigarh Tribune. The revelation has raised questions on the security arrangement of the jail as they should have been noticed by the security personnel from the watch tower. The sources said Jagtar Singh Hawara, Paramjit Singh Bheora and Jagtar Singh Tara walked up to the nearby gurdwara by jumping over a nullah. The sources said electricity or no electricity, it might not have made much difference to their escape as because of the rain the security personnel, on the watch tower under which the exit of the 94-feet-tunnel opened, had gone down stairs to save themselves from the rain on that night. The experts said even the lighting arrangement of the jail was not satisfactory and should be improved. The fact that the rain played an important role in their escape is corroborated as Hawara and others were able to see from their barrack how the security personnel behave in different conditions and the continued rain during that period for three days made their task easier. The experts said they were barefoot when they escaped as their foot print is embedded on the then soggy fields which they crossed. The experts have also found the loose earth excavated from the tunnel could have easily been spread out within the boundary wall outside the barrack. The level of this area had gone up between four and six inches to accommodate the loose earth. Some of loose earth had also been disposed of through septic tanks which had to be cleared more than two times. Engineering experts have confirmed this opinion but ascertaining the tool to dig the tunnel still remains tricky with no tool been recovered to dig the tunnel. They said they were measuring the tunnel inch-by-inch to find out what kind of tools were used. It seems both mechanical and electrical tools were used for the purpose. Experts view the jail workshop with suspicion saying that such an improvised tool could have been manufactured in the jail factory. Experts are trying to ascertain that it could have been an electrical one as it was difficult to stay in the tunnel and carry on the digging operation staying inside the tunnel. The alleged assassin of Beant Singh, Jagtar Singh Hawara, had retained his codename “Prince” since he was trained in Pakistan more than eight years ago. Khalistan Zindabad Force member Attarjit Singh who was arrested by the Jammu and Kashmir Police has revealed that Hawara had the same code-name in Pakistan also. The fact came to light after a team of the Chandigarh police returned from Jammu after interrogating him. Attarjit told the team that he had met Hawara, Paramjit Singh Bheora and Jagtar Singh Tara in Burail Jail where he was lodged in connection with bomb blasts in Pathankot. Attarjit also revealed that the modus operandi of the operation of Hawara was the one given by the ISI during his training. He said it included giving tasks on the “need-to-know” basis and creating a chain of persons who only knew code names of each other. Attarjit said he had not met Hawara and Bheora after his release from the jail and had not visited Chandigarh since October last year. He revealed that he was also planning to slip away abroad as he was not to accepted back in the family. The police is evaluating the details of the interrogation to consider if he should be given a production remand to find a link between the escape of Hawara and Attarjit’s disappearance from Jammu. As of now no link has been established. The Union Minister for Road Transport and Highways, Major-General B. C. Khanduri (retd), today performed the bhoomi poojan ceremony for the four-laning of the Ambala-Chandigarh road (NH-22) from km 5.6 to km 40 up to junction with NH-21 under the Pradhanmantri Bharat Jodo Pariyojana (PMBJP). The two-lane stretch connecting Chandigarh with Ambala has one of the highest traffic densities in the country. It has also come to be known as the killer stretch because of the almost daily fatal accidents involving road users. The total length of the road is 35 km. The two-lane road will be upgraded to four lanes at a cost of Rs 190 crore in two-and-a-half years. It will involve construction of one flyover, three major bridges besides a number of service roads in urban areas falling along the highway. The brief bhoomi poojan ceremony held by the side of the busy highway was attended, among others, by the Governor of Punjab and Administrator of UT, Chandigarh, Justice O. P. Verma (retd), Punjab Minister for PWD, Mr Partap Singh Bajwa, local MLA and former Minister, Capt Kanwaljit Singh, sitting MP from Ambala, Mr R.K. Kataria, and former Chandigarh MP, Mr Satyapal Jain. Speaking on the occasion, Maj-Gen Khanduri said that the Chandigarh-Ambala road was being widened under the PMBJP which envisaged construction of 10,000 km of national highways at a cost of Rs 40, 000 crore. He was sure that the widening of the road would give a fillip to the trade and commerce to the region as a whole because it was being used by vehicles from Punjab, Haryana, Himachal Pradesh as well as Chandigarh. The Governor said he was happy to note that the long-felt need of the people of the area was being met. Capt Kanwaljit Singh who represents the area in the Punjab assembly said that while he was thankful to the Centre for taking up the four-laning of the road, he would urge the Government of India to widen a major bridge on the road connecting Zirakpur with Panchkula. The 70-year-old bridge was in a dilapidated condition and had become a major traffic bottleneck. The Kalka-Shimla national highway connecting the capital of Himachal Pradesh with the rest of the country, will be four-laned within the next three years. This was stated here today by the Union Minister for Road Transport and Highways, Major-Gen B.C. 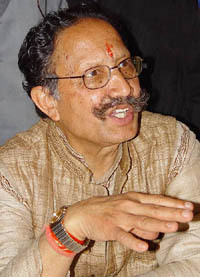 Khanduri (retd) in a talk with TNS. “We plan to take up this important stretch of the national highway after the forthcoming Lok Sabha elections. We hope to complete it by 2007”, he said. The Union Minister was here in connection with the Bhoomi Poojan ceremony for the four-laning of Ambala-Chandigarh road (NH-22) under the Pradhanmantri Bharat Jodo Pariyojana (PMBJP). He was at pains to counter the general impression that major engineering projects like building of dams and roads undertaken in the country were prone to cost overruns due to the fact that they were seldom completed according to the schedule. “The situation is now absolutely different. The fact of the matter is that the entire project of four-laning of 10,000 km of national highways at a cost of about Rs 40,000 crore under the PMBJP is being executed on BOT basis according to the schedule. In some cases, several stretches of highways have been completed ahead of schedule, entitling the road contractors to claim bonus from the government”. The minister said that only last week he was in Bangalore where he had distributed bonus amounts ranging between Rs 1 crore and 8 crore among the road contractors for completing four-laning of their stretches of highway ahead of schedule. “It is, therefore, wrong to suggest that nothing can be done on time in India…It is a defeatist mentality. It is also not correct to suggest that the country lacked the necessary skill to undertake major projects and only foreigners could undertake them. I am very happy to point out that only a handful of foreign companies are involved in the gigantic project of four-laning of national highways. All the other companies involved in its execution are Indian. “Since the construction of a project of such a gigantic scale required import of heavy machinery from abroad, the government had allowed its duty-free import”. The minister said that the four-laning of 10,000 km under PMBJP was over and above the 14,000 km already being four-laned under the National Highway Development Programme. Thus, the total length being four-laned under NHDP and PMBJP will be 24,000 km by the year 2007. Under the PMBJP, all the state capitals which were away from NHPD will be linked by a four-lane road. He said steps had also been taken to engage design consultants for preparation of detailed project reports for yet another 1700 km long stretches which would be taken up for implementation in 2004-2005. Class X students of St Soldier International School in Sector 28 received a shock when their hair were chopped reportedly on the Principal's order, provoking them to demand police action. The incident also infuriated the parents, but they preferred to play down the matter "in the interest of their wards". The Principal was reportedly angry as some Class X boys had long hair. On the other hand, the students alleged that the Principal had subjected them to unnecessary embarrassment. Moreover, their hairstyle had been spoilt. The students also alleged that the Principal had not asked them to sport short hair. The hair were allegedly cut by a physical training instructor (PTI), Mr Gopal Singh, just after the morning assembly. The students, however, alleged that hair of over 20 students were chopped by the PTI. As many as 12 students reported the matter to the Sector 26 police. Following the complaint, a daily dairy report (DDR) was lodged, but the police has refused to covert it to an FIR. The Station House Officer, Mr Jarnail Singh, when contacted said, “No case could be made out as none of the affected students were Sikh”. Police sources said a compromise was reached between the parents of the students and the Principal. As soon as the morning assembly concluded, the Principal Ms Swadesh Chaudhary asked students of Class X to line up in four queues. “The Principal asked the PTI to bring a pair of scissors and the PTI started chopping hair on the frontal side,” said a student whose hair were chopped. Another student of the school complained that the rest of the children were laughing at them when the PTI was cutting their hair. ‘‘She has done the same thing in past also, but this time we decided to report the matter to the police,’’ informed a student. The police later called up the parents of the students to the police station. The mother of a student said the Principal had no such right. ‘‘If she wanted the hair of her students to be short, she should have asked the parents,’’ she said. The Principal could not be contacted for comments. The District Education Officer, Mrs Rajesh Chaudhary, said she could not comment as neither the students nor their parents had made any complaint to the Department of Education. Mr D.S Bedi, president of the Association of Independent Schools, Chandigarh, said the Principal should have asked the parents to shorten their hair of their wards. In a marked departure from established norms, Territorial Army (TA) officers are being attached with the Army’s special forces for training. The move has raised questions over the legality and purpose as it violates the TA’s basic charter. Sources told The Tribune that about 20 TA officers had already undergone training at the special forces establishment at Nahan in Himachal Pradesh since the TA Directorate at Army Headquarters issued orders in this regard recently. The duration of attachment with the special forces is stated to be about four weeks. “The TA’s charter is to relieve the regular Army of static duties and form a second line of defence in the event of hostilities,” an officer here remarked. “The role of the special forces, on the other hand, is to operate behind the enemy lines,” he added. The move comes in the wake of an earlier decision to send commissioned TA officers to the Indian Military Academy (IMA) at Dehra Dun for a three-month training stint. This move too had raised several eyebrows, with Army Headquarters reportedly asking the TA Directorate for an explanation. Sources said that officers were sent to the special forces establishment directly after their three month training at the IMA, thereby making up a continuous training period of about four months. Sources added that another batch of about 20 TA officers was presently undergoing training at the IMA. Training rules, officers here said, require 30 days initial training on getting commissioned and attending a 60-day annual training camp in respective TA units. A recent directive issued by the TA’s Additional Director General required that post commission training at the IMA is to be carried out within four years of obtaining a commission. What is peeving TA officers is that they have been put up at the IMA’s Army cadet College Wing, which imparts training to JCOs and NCOs of the regular Army who have been selected to become officers. Further, TA officers, many of whom have field experience, including service in counter insurgency environment, are being trained alongside cadets who are yet to become officers. Though they wear their badges of rank, they are not entitled to a salute by subordinates. Earlier, TA officers were required to undergo a mandatory 42-day Young Officer’s Course (YOs) at the Infantry School, Mhow, alongside regular officers of the rank of captain. Like any other girl of her age, Yamini Reddy is also going through a phase of confusion regarding her choice of a career. But for Yamini the tension is much high, for too much is at stake it is either lose one year of her dance practice and performances and join a management course for arts and media at the University of Warwick, UK, or to continue to do what she was born to do- Kuchipudi. “I have been selected by the University of Warwick for this course in arts management which I am tempted to take up. But it again means staying away from my dance and that too when I have just started making my mark in the classical dance circle,” says Yamini, looking a trifle worried as she talks about her aims and aspirations in life at a local hotel in Sector 35 here today. Accompanied by her father Raja Reddy and Kaushalya Reddy, Yamini is in town to perform at the Festival of Young Dancers. It’s not the lure of studying abroad that has put Yamini in such a dilemma, for this upcoming Kuchipudi exponent has already turned down an opportunity to study medicine abroad. “Other than becoming a complete performer I want to give the art scene in India a proper direction, proper infrastructure so that more and more youngsters feel secure enough to join this field,” says Yamini, and in this context this particular course at Warwick is going to help me, she adds. As Yamini has a few more months until the summer to make up her mind, her time at present is divided into her studies and performances. “My exams are approaching and so after a few more concerts I am going to withdraw myself from dance for a while,” says Yamini. Three more concerts are already on the line — one is in Agra on February 20 and second in Delhi on March 4 and the third one in Bhubaneshwar after that. Born to legendary Kuchipudi exponents, Padma Bhushans Raja and Radha Reddy, Yamini has got everything that is needed to be a first class danseuse - inclination, proper training, right facial expressions and a body flexible enough to match the rhythm of the dance form. “Even if I were not born into the Reddy family, I still would have taken up Kuchipudi for its effervescence characteristics,” says Yamini, explaining her love for the dance form. “Kuchipudi provides a great scope for abhinaya and this is the only dance form that has dialogues in it,” she says. Yamini’s talent is not restricted to dance only, she is also learning Carnatic style of classical vocal from P. Durga Prasad as well as painting. “Painting is my hobby, but I am learning music, for it helps me in my performances, also at some later stage in my life I would like to choreograph,” she says. What about trying her luck in Bollywood? “If the right thing happens at the right time I might give it a shot,” concludes Yamini. An over Rs 24.31 crore budget for the year 2004-2005 is proposed to be presented at a special meeting of the municipal council scheduled to be held on February 20. The budget proposals show an income of over Rs 23.61 crore. The balance carried forward from the previous fiscal is Rs 70 lakh. The civic body has proposed an increase of about Rs 1.05 crore in income as compared to last year. The proposed income last year was over Rs 23.26 crore. The proposed expenses come to more than Rs 23.61 crore. Expenditure on the staff amounts to over Rs 6.01 crore, which comes to 26 per cent of the proposed income. A sum of Rs 16.53 crore has been proposed for development works in the town which comes to about 68 per cent of the proposed income. A sum of Rs 1.06 crore has been proposed under the head of contingency expenditure. The council proposes to take a loan of Rs 3 crore from a bank for the construction of its office building in Sector 68 here so that the work gets completed in time and the civic body does not keep paying rent for its accommodation. The council expects to earn Rs 16.91 crore from octroi, which is the main source of income. A sum of Rs 1.10 crore is expected to be earned from octroi on power. Last year the proposed income under this head this head was Rs 90 lakh. The civic body’s other sources of income include excise duty (Rs 1 crore), water supply and sewerage (Rs 70 lakh) and rent and tehbazari (Rs 25 lakh). The council has proposed to spend Rs 2.52 crore more on development works in the town this year as compared to last year. Even the amount proposed for expenses on the staff has gone up by more than Rs 1.37 crore this year. A sum of Rs 3.35 crore has been proposed to be spent on power bills related to the supply of water. Another Rs 2.25 crore has been proposed for streetlight power bills. A sum of Rs 3.03 crore has been proposed to be spent on the strengthening and maintenance of roads. Last year Rs 1.90 crore had been proposed under this head. The proposed amount to be spent on disposing solid waste is Rs 1 crore against Rs 80 lakh proposed last year. The proposed expenditure on sanitation wing is more than Rs 1.77 crore while that on works branch is more than Rs 1.48 crore. The decision of the UT Administrator to not acquire any more lands in UT villages has been welcomed by members of the zila parishad, panchayat samiti, and sarpanches here. In a signed statement, 25 elected representatives said they appreciated Administrator Justice O.P. Verma and local MP Pawan Bansal for their efforts. Two days ago, Mr Bansal had said that the Land Acquisition Act had lost its relevance. Farmers should be made partners in development schemes, said the statement. Meanwhile, president of the local unit of the Congress B.B. Bahl held a meeting at the party office where the efforts of Mr Bansal and the Administrator were appreciated. Activists of the Youth Congress and National Students Union of India today expressed their displeasure at rise in unemployment by cleaning the windscreens of cars and selling newspapers at the Government Press traffic light point. Mr Harmohinder Singh Lucky, president of the Youth Congress, said the Prime Minister had failed to keep his promise of generating 1 crore jobs each year. “The ‘feel good’ and ‘India shine’ campaigns by the BJP regime are of no use, as with the present state of affairs, there is nothing to feel good about for country’s youth,” he said. Instead of creating new jobs, the government was abolishing old jobs, Mr Lucky alleged. The police has registered a case against the Mahila Congress president of the Mohali block and others on charges of voluntarily causing hurt with dangerous weapons and criminal intimidation. It is learnt that Ms Narinder Kaur Pappi and six others had allegedly attacked two employees of a cable TV operator in Phase XI last night. One of the injured persons, Mr Dhiraj Kumar, was taken to the Chief Hospital in Phase VI. According to a complaint to the police, Ms Narinder Kaur had allegedly not paid her dues for about six months for the cable connection to her house. As such, the cable operator had cut the connection. It is alleged that after the connection was cut, the Mahila Congress president threatened the employees of the cable operator. The complaint further said that when employees of the cable operator were passing through the area last night, they were allegedly attacked with sharp-edged weapons. The police has registered a case under Sections 341, 324, 506, 140 and 149 of the IPC against Ms Narinder Kaur, Monty, Rami, Lucky and three others in this regard.